Summer fair season comes to an end with the Overbrook Osage County Fair, Aug. 8-11, 2018, and this year’s fair promises its traditional competition, fun and entertainment. Following exhibits, a carnival, kids’ games, everyone’s favorite fair finale is Overbrook’s annual parade on Saturday night, this year celebrating the theme of “Past and Present”. All area high school bands are encouraged to enter the annual “battle of the bands”, with cash prizes for winners. Overbrook invites everyone to come and enjoy this year’s fair. Here’s the schedule. 8-11 a.m. – Entries open – all entries, except dog and hand pets enter at show time; sign up for photography judging contest; arrival of all livestock for entry, goats and sheep must be vet checked prior to unloading; donuts and juice at show arena. 11 a.m. – Sheep and goats must be entered, vet-checked and unloaded by 11 a.m.
11 a.m. – Mandatory meeting for all livestock exhibitors in the show arena. 12 p.m. – Judging of all exhibits begin, food for sale after judging, except livestock. 12-1 p.m. – Weigh-in of all beef, sheep, swine and goats. 1 p.m. – Photography judging contest begins. 6 p.m. – King and queen crowning ceremony at show arena. 7 p.m. – Sheep show followed by dairy and goat shows. Pet entries due 30 minutes before shows. 9:30 a.m. – Dog show, location to be determined at later date. 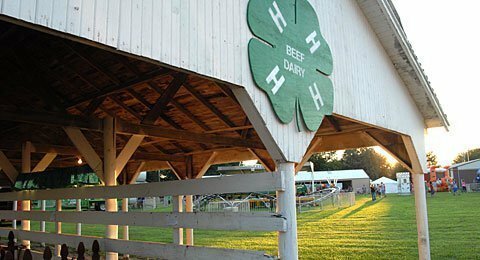 7:15 p.m. – 4-H livestock sale; 4-H livestock sale buyers dinner immediately following sale. Schedule information from the Osage County Fair Book.